Is Yandex NV (YNDX) a Good Stock to Buy? 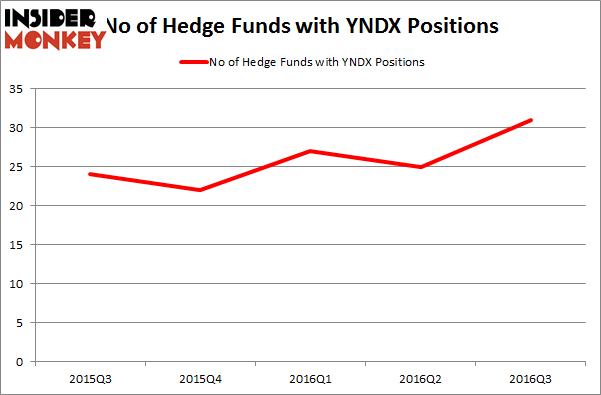 One of the stocks that has registered an increase in hedge fund sentiment lately is Yandex NV (NASDAQ:YNDX). However, the level and the change in hedge fund popularity aren’t the only variables you need to analyze to decipher hedge funds’ perspectives. A stock may witness a boost in popularity but it may still be less popular than similarly priced stocks. That’s why at the end of this article we will examine companies such as Spectrum Brands Holdings, Inc. (NYSE:SPB), Crown Holdings, Inc. (NYSE:CCK), and Qorvo Inc (NASDAQ:QRVO) to gather more data points. With all of this in mind, we’re going to analyze the recent action surrounding Yandex NV (NASDAQ:YNDX). At the end of the third quarter, 31 hedge funds tracked by Insider Monkey were bullish on Yandex, up by 24% from the end of June. With hedgies’ positions undergoing their usual ebb and flow, there exists a select group of noteworthy hedge fund managers who were upping their holdings considerably (or already accumulated large positions). According to publicly available hedge fund and institutional investor holdings data compiled by Insider Monkey, Dmitry Balyasny’s Balyasny Asset Management has the number one position in Yandex NV (NASDAQ:YNDX), worth close to $80.9 million, corresponding to 0.5% of its total 13F portfolio. The second largest stake is held by Discovery Capital Management, led by Rob Citrone, holding a $49.6 million position; 1.1% of its 13F portfolio is allocated to the company. Remaining members of the smart money with similar optimism comprise William B. Gray’s Orbis Investment Management, Kevin D. Eng’s Columbus Hill Capital Management, and Richard Driehaus’ Driehaus Capital. 5 Stocks Hedge Funds Are Betting Against Insiders Five Dow Jones Stocks That Can Outperform The Market The Big Short’s Michael Burry Reveals His New Stock Picks 5 Micro-cap Stocks Billionaires Love The Most Constellium NV (CSTM): This Metric Is Giving A Huge Buy Signal Is Becton Dickinson and Co (BDX) A Good Stock To Buy Right Now?